Home › Home and Kitchen › Best Ever Premium Mini Tongs (Set Of 4). Perfectly Designed High Quality Sili..
Best Ever Premium Mini Tongs (Set Of 4). Perfectly Designed High Quality Sili..
HOW WE'RE DIFFERENT: Best In All Mini Tongs are built to last. We made the most durable Tongs that WILL NOT WEAR DOWN with repeated use. Every time you use the Best In All Tongs, you'll know that you are using Best Tongs and they are guaranteed to last. SUPERIOR QUALITY: Best In All 5 inch mini Tongs are made of Stainless Steel with Silicone heads. Resistant to high degree heat, stain and odor free. These little tongs are awesome, highly durable, totally useful, clean right up in the dish washer, and easily fit in the kitchen drawer. PERFECT FOR BUFFETS: Perfect for buffet style spread for finger foods. You will be amazed how nice these tongs are when serving appetizers or even items like shrimp, small rib pieces, cheeses, meatballs, bacon strips, sausage and more. Looking to serve croissant sandwiches at a gathering? Look no further, these tongs works great, they open wide enough to fit the croissant in without tearing it. GREAT FOR WEDDINGS/PARTIES/HALLOWEEN/THANKSGIVING/CHRISTMAS: Best In All Tongs fit best for all occasions. Perfect for party candy bars, salad buffets. You can have these tongs to pick up melon cubes, grapes, tomatoes, onion slices, peach slices, cubes of cheese, olives, broccoli, lettuce, cauliflower, and baby carrots. These tongs are really pretty, brightly colored and incredibly well made. Absolute must for party favors! 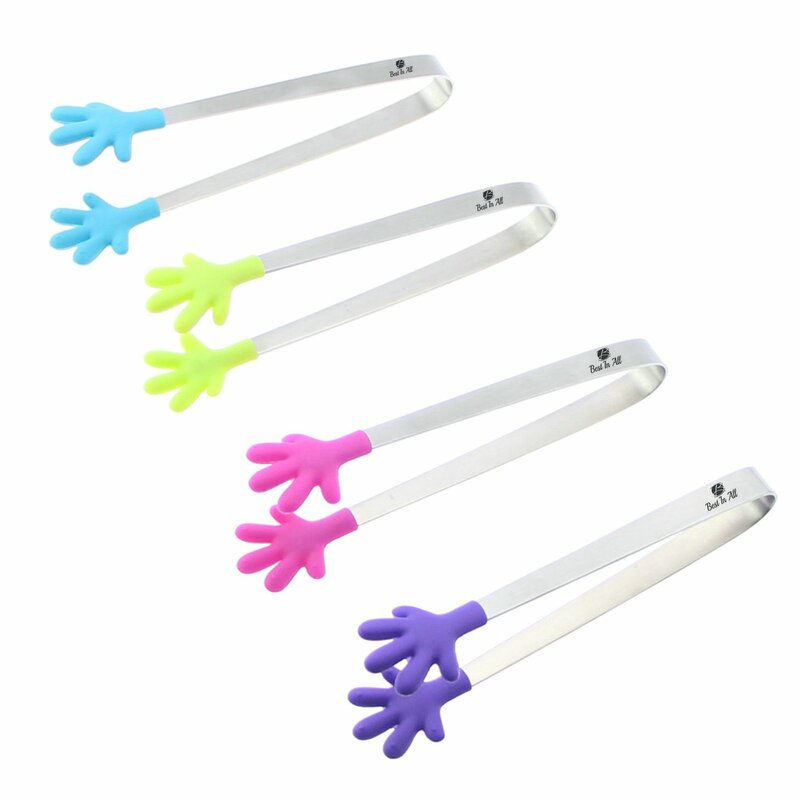 SMALL HANDS AND ARTHRITIS FRIENDLY: Having hard time with big heavy tongs? Best In All Tongs handles everything so well, made of silicone tips, heat resistant - They work perfectly to flip bacon and sausage and great for browning small pieces of meat, mushrooms, bacon strips, sausages, anything that you might want to flip or evenly brown. The small size gives greater control over the items you want to flip over. Color: Set of 4 Best In All mini Tongs are made of Stainless Steel with Silicone heads.Resistant to high degree heat, stain and odor free. These little tongs areawesome, highly durable, totally useful, clean right up in the dish washer,and easily fit in the kitchen drawer. If, for any reason, you are notdelighted with your purchase, we will replace it or give you 100% of yourmoney back.